Having me behind the wheel of a car, in a major city, in left-hand traffic, after more than twenty years would be a disaster waiting to happen. So I've done what any sane adult would do: join a travelling circus take driving lessons. No, I'm not going up there before I know what I'm doing. Driving schools offer short refresher courses for people who no longer remember how to drive ("paper drivers") or want to brush up specific skills. They may have lived in a big city and never owned a car, or their spouse did all the driving. Or they do drive, but only in a quiet rural area. 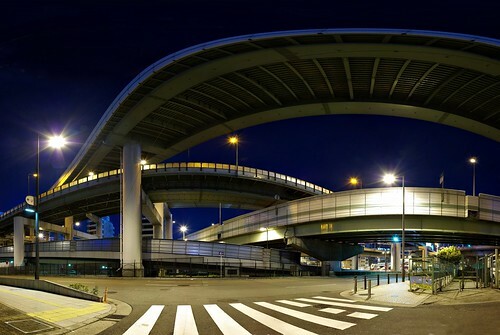 I enrolled at the Orix driving school (warning: Japanese website design) in Minato-ku last week. I picked them only because getting there from home is convenient — they're right along the Chuo subway line — and because they had a special offer on their paper driver course, with 17000 yen for three lessons. The first lesson was on their enclosed track. It let me get used to driving again and let the instructor evaluate my skill level without any old ladies being mowed down in the process. Turns out I do remember how to drive. Controlling the car, looking the right way, and starting and stopping smoothly came back to me immediately. I took the narrow S-turn and "crank" sections — a staple of the Japanese driving test — without trouble. The second and third lessons were out in traffic. At first we just circled around the fairly quiet streets in the harbour area, then we moved towards Nishi-ku and the high-density traffic in Namba. 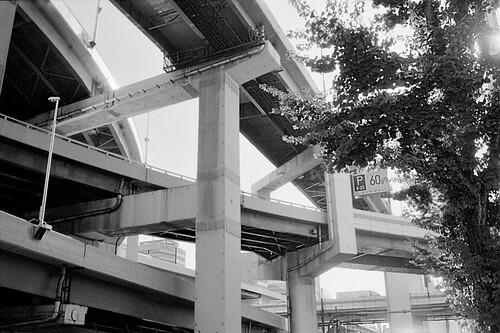 Osaka is possibly one of the worst places in Japan for driving. Like Tokyo or Nagoya it's a big, busy city with lots of traffic and a complex road environment. 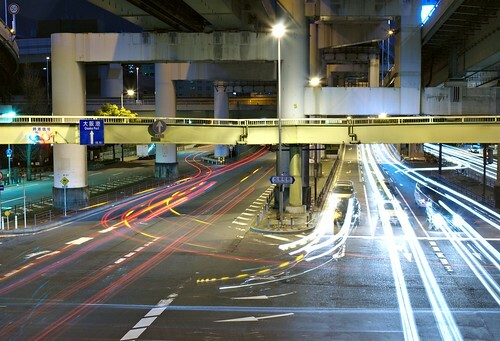 But Osaka is worst in the country at following traffic rules(1). Pedestrians and bicyclists see signs, red lights and road markings as an annoyance or an art installation to enjoy while you saunter across the road or weave between cars going the wrong way along the middle of the street. This is a public road. For cars. Good luck. To my surprise I got — well, not used to it, exactly, but I got resigned to the traffic fairly quickly. The speeds are pretty low overall, and people do drive conservatively. Speed regulation takes a bit of time to get used to. In Sweden, speeds are 50 or 30km/h, and it's easy to guess which just from the road. 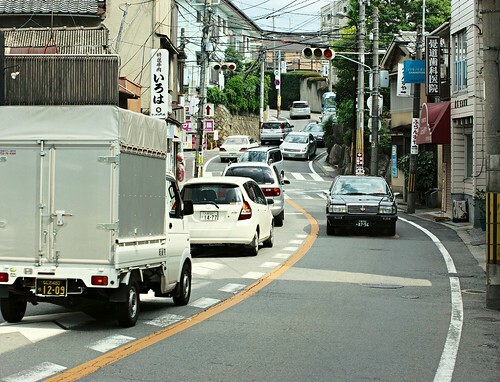 The default speed in Japan is 60km/h, but almost every street is regulated differently, with signs specifying 30, 40 or 50km/h, often with no obvious reason. Smaller road in northeast Osaka. I'd been prepared to add a lesson or two if needed. But at the end of the third lesson my teacher told me that I'm doing well enough to drive by myself in Osaka, and should be able to drive anywhere in Japan now. Good enough for me. I can figure out the highway tolls and tower parking systems by myself. This time I won't let my skills go bad again, so I'll make a point of renting a car every six months or so from now on. We'll probably just end up going to IKEA or something, but since driving practice is the point that doesn't much matter of course. Highways? I'll figure them out. I hope. #1 Osaka has the highest all-over crime rate in the country, so I'm not too surprised. Friday was the first day of my (hopefully rather temporary) unemployment. 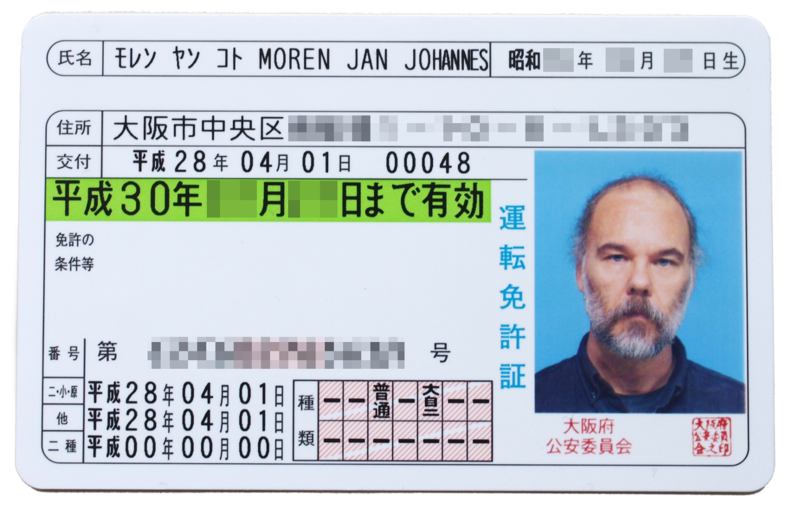 With a bit of free time on my hands, I'm taking the opportunity to do something I should have done years ago: convert my Swedish driving licence(1) to Japanese. I haven't done so mainly because we live in Osaka, with excellent public transport, and because owning a car(2) is quite expensive. A registered parking space in Osaka city would by itself cost more than my daily commute to Kobe every month. But now that I am differentially employed we no longer know what I will do or where we will live. Rural Japan has nothing like the dense subway and bus networks of the big cities so it's prudent to make sure we can get around anywhere just in case. Converting a foreign licence can involve taking a theory test or even a simplified driving test for many countries. But for Swedish licences it's only paperwork, with no actual testing involved. They interview you and look over your documents to make sure that your training corresponds to what you would get in Japan; and that you lived in that country for at least three months after getting the licence. That's so young Japanese don't go to Indonesia or some place, get a licence there in a one-week intensive course, then convert it to a Japanese licence when they return. Your licence and your passport, and copies of them. If you have renewed your licence since coming here, bring your older licences and passports too. A certified translation of your licence. You get that from JAF (Japanese Automobile Federation). The main point of the translation is not the language itself, I think, but that they translate the specifics of vehicle classes into the Japanese equivalents. Car and bike sizes and weights, allowable passengers and that sort of thing. Your 住民票 or Certificate of Residence. You get that from your local ward office. Just tell them what you need it for and they'll give you the right document. A picture, 3cm by 2.6 cm. This is not the picture that will end up on your licence. This is attached to your application so everybody can confirm that the same person is applying, taking tests, sitting for the licence picture and so on. Proof that you lived in the country for three months after getting your licence. A passport with an entry stamp to Japan is not enough. I brought my Ph.D. certificate (showed that I went to grad school in Sweden), a Japanese certificate for my first job here that showed my address in Sweden, and a statement of financial support (also in Japanese) that showed my Swedish address at the time. Things like a phone bill or rental contract would work fine too. First, go to the main JAF office. In Kansai that's in Ibaraki in Osaka, towards Kyoto. It's small and fairly quiet, and I think all other people there were also foreigners looking for a translation. For the most part, JAF's services involve things like emergency assistance, publishing maps and things like that; you don't normally need to visit them in person. This is one of the few things you do on-site. It took them about 30 minutes to translate the licence. Furukawabashi station on the Keihan line. Then, go to the Osaka prefectural police Driver's Licence Center in Kadoma in the north-east of Osaka city. It's along the Keihan line; you ride the express to Moriguchi, then change to a local train for another four stops to Furukawabashi. Walk south for about 1.5km and you're there. 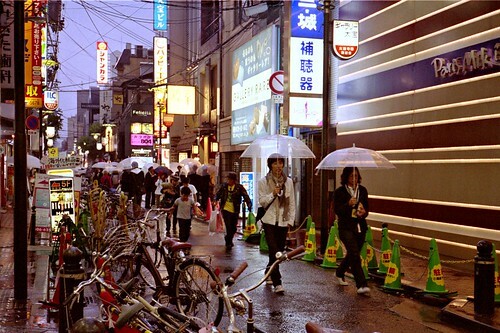 Pretty neat area, with lots of shops, some good cafés and a Kurazushi if you like your kaitensushi cheap and cheerful. I know I do. When I get there they tell me that they accept applications between 8:30 and 13:30. As it's already past 2pm I'm too late. But they were happy to check my documents and see that I had everything I'd need. I come back the next morning around 9am and met by chaos, with hordes milling about queueing up for their licence exams. If you come there to actually take the theory and driving tests you need to be there in the morning to get through the entire process by the end of the day. So the place is infested with nervous 20-somethings lining up for their licence exam applications, not unlike ants descending on a picknick. Fortunately, the foreign licence exchange is a separate counter and not busy at all. You walk up, they check the documents you have and give you a two-page form to fill in. That form asks you when and where you took your licence, and what, exactly, you did to get it. What driving school did you use, or did you practice privately; what kind of theory test did you take - how many questions, yes/no or multiple choice; what did you do during the practical test and so on, and so on. You fill it in as best you can (English is fine), and bring the form back to the counter. There a policeman who I swear could play the lead part of "insubordinate but likeable younger detective" in a police drama looked it over and asked me a series of detailed questions about the order of licence renewals; what, exactly, I did during car and motorcycle driving practice; and how the driving tests were conducted and in which order. I had to explain the ice-driving test in some detail; Japanese drivers apparently don't do that. It took about half an hour in all. It's all in Japanese; I could handle it without problems so you don't need to be fluent or anything, but if you're not up to explaining the finer details of your driving school experience you'll want to bring somebody along to translate for you. While we were talking, the pile of licence test takers were finishing their eye test behind us. Next you pay for the licence at the cashier. The cost depends on the vehicle classes you want to convert. I converted heavy motorcycle as well as regular car, and that totals about 7000 yen in all. You move on to the eye exam — it was empty by the time I got there — and take the ten-second test. They only test up to the legal limits, so really, if you can't pass this you probably couldn't find the eye exam room in the first place. On the way back to the application counter you need to register a PIN code on a machine. This completely mystified me at first, but it turns out to have a point later on. You fill in two four-digit PINs — any code you like — and it spits out a ticket with the two PINs and a bar code. Hang on to that one; this will be the PIN code to access the digital data on your licence later on. Maneuver test for small bikes. Looked really easy, to be honest. Return your documents to the counter. There they will explain the exact terms and conditions of your licence. 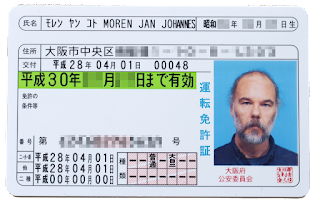 I'm a new driver in Japan so my licence is good for less than three years — until a month after my third birthday — and I'll have to put that "new driver" mark on any car I drive for the next year. Also, as a new driver I have some restrictions for motorcycles; I'm not allowed to ride a bike with a passenger for the first year and things like that. But I only converted my bike licence for old times' sake so I don't really mind. You get your documents back, along with a coloured card (mine was blue) with a time slot for the photograph and licence delivery on the second floor. My slot was 30 minutes later; enough for a can of coffee and a few pictures of the area. Meanwhile the huge pile of people are now lining up behind the test counters on the second floor. Get to the photography counter well in advance. They announce the time slot and card colour for the next group. You get called up by name, line up and go in one by one. Remember the PIN code ticket? You shove the ticket into a machine there, sit down, they take your picture and you're done. Go across the hall — the test takers have all disappeared to the testing rooms by now — to the licence delivery room along with the other people in your time slot. After ten or fifteen minutes a young office worker comes in, runs through a speech about responsibility and driving carefully, then calls each one up by name to deliver the licence. Congratulations, you are now a licensed driver! In all, the process took about two hours from the time I stepped into the building until I left. Not bad at all. Licensed to drive. Now I just need to learn how again. #1 is it "licence" or "license"? "Licence" is the noun, as in "A licence to kill". "License" is a verb, as in "You are licensed to kill cartoon villains for entertainment". #2 I actually have much more experience riding bikes than driving cars, but my biking days ended when I got married. We decided that bikes are dangerous so we don't ride them any more.